(Nanowerk News) The Amazon rainforest, energy grids, and cells in the human body share a troublesome property: they possess multiple stable states. When the world’s largest tropical forest suddenly starts retreating in a warming climate, energy supply blacks out, or cells turn carcinogenic, complex-systems science understands this as a transition between two such states. These transitions are obviously unwanted. As they typically result from severe external perturbations, it is of vital interest how stable the most desirable state is. Surprisingly, this basic question has so far received little attention. Now scientists of the Potsdam Institute for Climate Impact Research (PIK), in a paper published in Nature Physics ("How basin stability complements the linear-stability paradigm"), propose a new concept for quantifying stability. “Up to now, science was able to say if a complex system is stable or not, but it wasn’t able to properly say how stable it is,” says Peter J. Menck, lead author of the paper. The proposed concept is the first to fill this gap. “We conceive a system's alternative states as points in a mountainous landscape with steep rocks and deep valleys,” explains Menck. “In the sinks between the peaks, a system comes to rest like a rolling ball would. 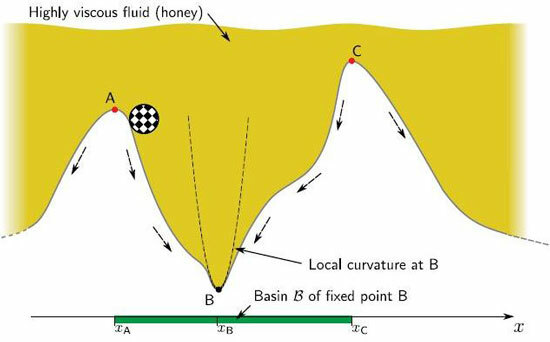 Now the likelihood that the system returns to a specific sink after suffering a severe blow strongly depends on how big the surrounding valley is.” In the high-dimensional systems Menck and his colleagues study, the equivalent of the valley is called the basin of attraction. The basin's volume is the measure the authors suggest to use for the quantification of stability. The authors envision the new concept to become a powerful tool for complex systems studies, including the assessment of climatic tipping elements like the Amazon rainforest. Under unabated global warming, this ecosystem might change from its present fertile forest state to a much drier savanna state. Such a transition would destroy one of the planet’s most important CO2 sinks, thus contributing to further climate change. “Amazonian bistability arises from a positive feedback: Deep-rooting trees take up water and transpire it to the atmosphere” Menck says. Forest cover in the region increases overall rainfall and thereby improves its own growing conditions. If the forest cover gets pushed below a certain threshold, this mechanism doesn’t work any more – the rainforest would die. Power grids have to function in good synchronization to assure that lights can be switched on everywhere anytime. Previous theory suggested that this should most easily be achieved if power grids had what researchers call a random structure, which in fact would yield many short-cuts between distant nodes. Yet in reality, grids look far more regular. Applying the basin stability concept shows why that is: In more regular grids, the desired synchronous state possesses a far bigger ‘basin’, hence is much more stable against perturbations.